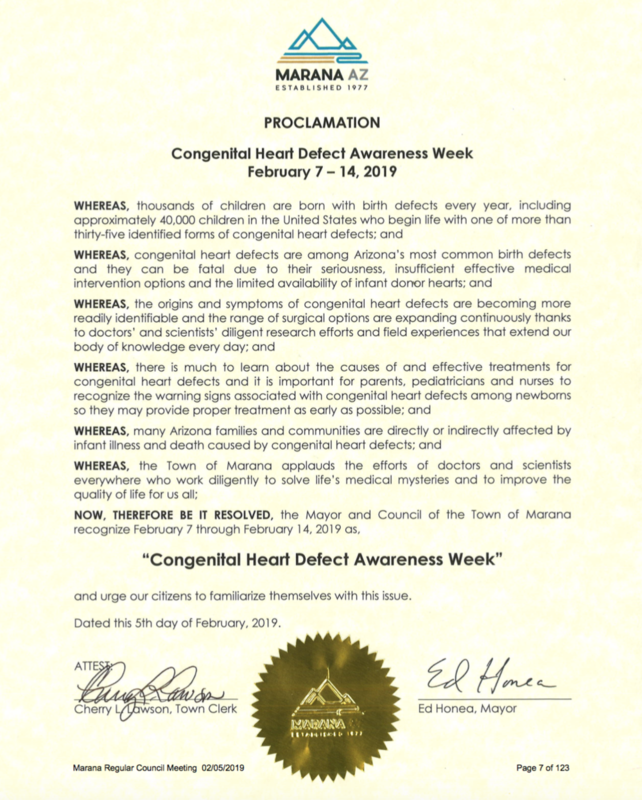 During their February 5 meeting, Marana Town Council proclaimed February 7-14 as Congenital Heart Defect Awareness Week. During the meeting, Mayor Ed Honea presented the proclamation to Jennifer Pajor, whose son Brendan was born with a congenital heart defect that required two open heart surgeries before his first birthday. “I am very pleased this proclamation has been issued to raise awareness,” Pajor said at the meeting. Pajor, a Marana resident, approached the Town of Marana about recognizing the issue, and she told Marana News that having Town Council take the time during the meeting to recognize the issue as well as her family meant a lot. “I feel like they care about this issue, and that they are willing to bring more awareness to a situation that’s really near and dear to my heart,” she told the paper. Approximately 40,000 babies are born each year with a congenital heart defect. While some are minor, some require very serious and immediate surgeries. The issue hits close to home as congenital heart defects are among Arizona’s most common birth defects. Read More about Congenital Heart Defect Awareness Week at the Marana News.